The below cartoon is more satire than funny. Most Americans are more than a little tired of Obama's playing more golf than the average worker who pays his salary. So, let's end on a little humor. While addressing Obama's handicap (somewhere in the 20s -- "classified"), Fox News Neil Cavuto chatting with professional golfer Tom Lehman admitted, "I got a score of 72! 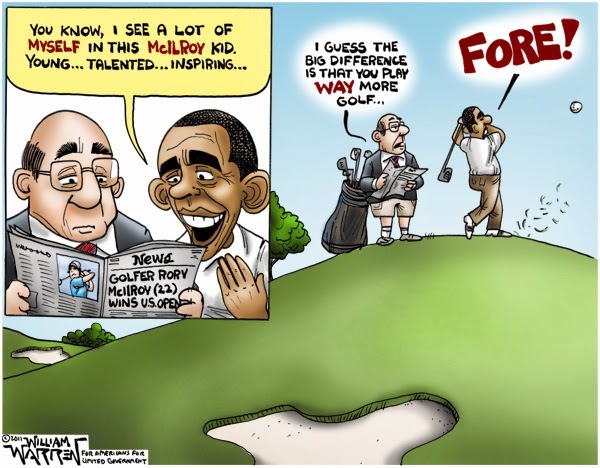 On the second hole, I think it was a..."
By William Warren : My latest cartoon weighs in on recent U.S. Open winner Rory McIlroy and Obama’s golf habits. Tags: Obama, Obama Playing Golf, Political Cartoons, Rory McIlroy, U.S. Open, William Warren, Neil Cavuto, Tom Lehman, golf, handicap To share or post to your site, click on "Post Link". Please mention / link to the ARRA News Service. Thanks! I for one support Obama's efforts at sharpening up his golf game. Anything that will get him out of the Oval Office, even if for an afternoon, helps the US and makes it a better country. 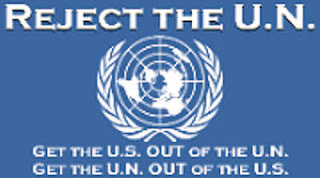 True, The US government is a ship without a rudder with him gone. However, all his efforts seem to be purposefully towards guiding the ship of state onto a reef so that it will sink. Well said John. I guess we can respell the word "Golf" as "Relief". Relief for America! Yep, look at those commie, hippie,wallstreet loving, union beholden, tax the rich, average joe hating, war mongering, peacenik bastards http://www.npr.org/2011/06/20/137298601/the-political-purpose-of-obama-and-boehners-golf-game Oh wait, not Boehner, he's awesome. Too bad W wasn't out more....Bush spent 487 days at Camp David and that is not even where the president has spent the most time when not at the White House: Knoller reports that Mr. Bush has made 77 visits to his ranch in Crawford during his presidency, and spent all or part of 490 days there. Note for Art - straining to support BHO. Unfortunately, you have forgotten the purpose of Camp David. It is a second White House but in a more "out of the fish bowl" secure environment. Activities of the President continue the same as at the White House but without all the various junior staff around. Even President Jimmy Carter used and other presidents used Camp David to hold summit meetings with leaders of other countries. The Tax Payers already pay for Camp David and it is fully manned, staffed and secure. The costs are not new but already committed costs. Also, all home locations of Presidents are mini White House locations - unlike Golf courses and recreational vacations. The Bushes as had other numerous presidents felt that it was far cheaper for the taxpayers for them to operate out of one of the three locations. The President is never off duty and is secure in these three locations at minimum cost to the president. The Obamas however, has optedto make the Presidency one grand vacation (using daddy taxpayer's money) to travel the world -- and these travels cost far more than if he had had been with his family at Camp David or a secure home location where all the security and communications costs would have been "sunk costs." Again, Camp David exists. Every time, the present president goes and plays golf, he disrupts the other citizens of America, blocks access to people from their home areas, and spends large chunks of the taxpayers money. Recall that Presidents FDR (D) Truman (D), LBJ (D) and GHB (R) and GWB (R) rightfully believed that while men and women were committed to combat, they should either be at the WH, Camp David or working out of their homes rather than vacationing and playing at public recreational activities. Of course BHO is nothing like any of these former presidents in actions, demeanor, or leadership.